Three cheers for shorter weeks because that gets us back to Friday that much faster!! I can't believe this is the last Friday of May and that we are into June in a few short day!! Slow down time, just slow don and yes I realize I just said "woo hoo" for shorter weeks!! 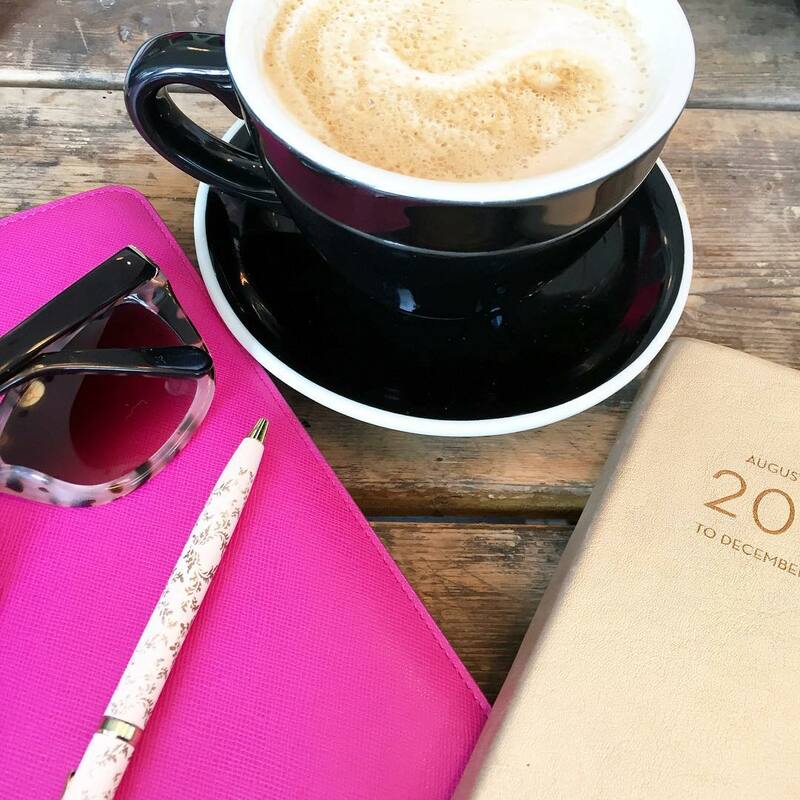 I'm getting right into it this Friday and linking up with my favorite Grecian Goddess, Amanda, fresh off her amazing honeymoon! I'm all about easy weeknight meals and this flat bread is just that!! Add a delicious arugula salad on the side and you've got dinner in 15 minutes! It's going to come as no shock that the TIU Girls did it again and I worked out to both the Abs and Arms videos twice this week! How fun would this globe be to your shelf or even a bigger desk? 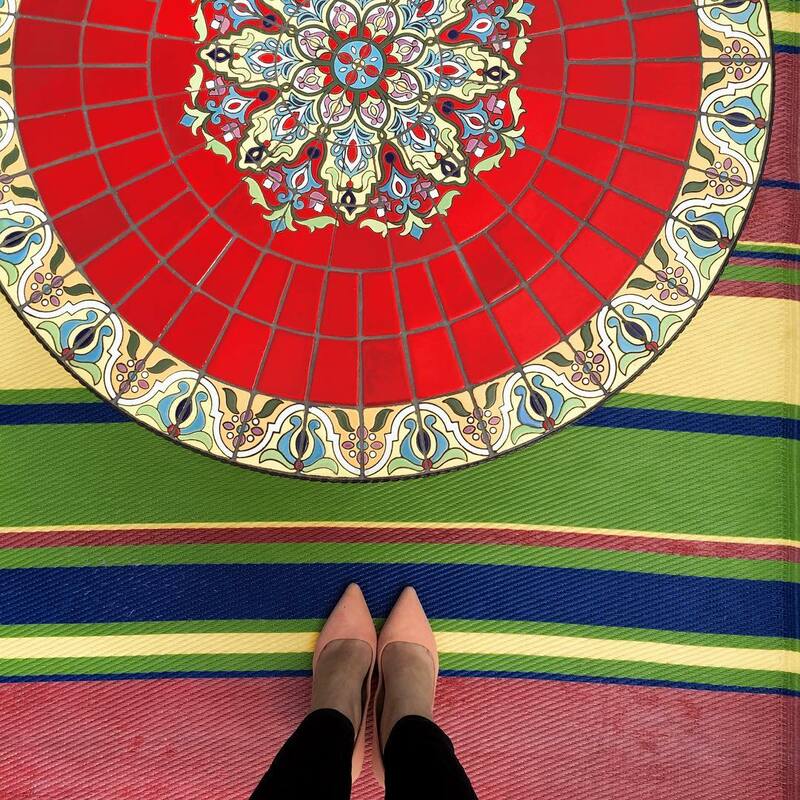 Love that you can play around with the colors too! // Changing out my drab winter totes for some of these more fun ones! That's the round up for the week!! Hope you have a wonderful weekend! Yum to the flatbread! Love the skirt--I knew it was from Loft (since I stalk their website lol jk...kinda :) I love changing out my bags/totes for the time of the season. Spring/Summer ones are so much more fun! I love that globe! SO cute! I just wish I had nice handwriting to write on it an still have it look that cute haha! Love your skirt you rocked this week too girl! So pretty! Have an amazing weekend love! Seriously the prettiest globe I've ever seen! I kinda want to make one now. Hope you have a great weekend!!! Such a cute globe!! Flatbread is such a yummy treat, anxious to try this one!! And I am always game for a new workout! Looks like a goody!! Happy Friday sweets!!! I think it's time to switch out my tote as well! Something about a bright, fresh pink tote for work makes me insanely happy. Yes to the TIU girls! Is there show coming back? Love that new skirt major score!! YES to that flatbread - such a great flavor combo! I'm also loving the playfulness of that globe - I've been looking for some new DIY projects and something like this would make such a great desk addition! I need to try that flatbread!! LOVE that globe - such a cool idea!! And your skirt is fab! Have a great wknd, girlie! That globe is so cool & love your skirt! Have a great weekend! All the Yes's to that flatbread. Love the skirt on you! I need to try the Bikini Arms workout, I need to change my routine up. Happy Friday! I'm OBSESSED with your skirt. Adorable. Ahhhhh love that globe! 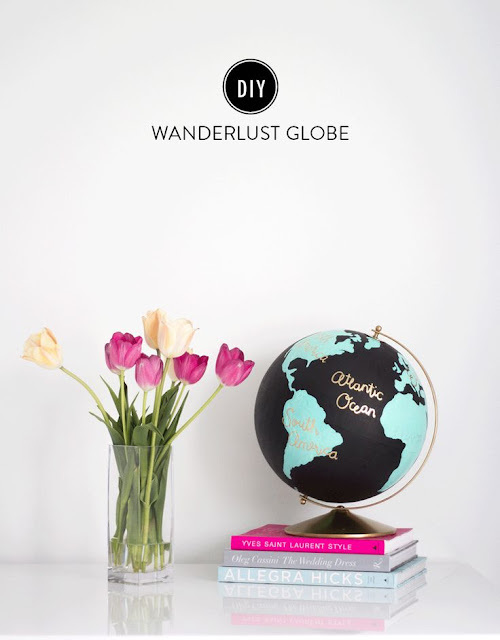 I've always wanted a nice globe for the home office, but love that DIY one. Love that flatbread! Perfect for summertime :) That's a really cute skirt too! Okay that flatbread!!! Must make. That globe is fabulous! I would love to have that in my office. Definitely checking that link out. Have a great weekend Biana! i almost bought the maxi version of that skirt! super pretty print. have a good weekend love! I can't believe it is Friday again. I'm not complaining! 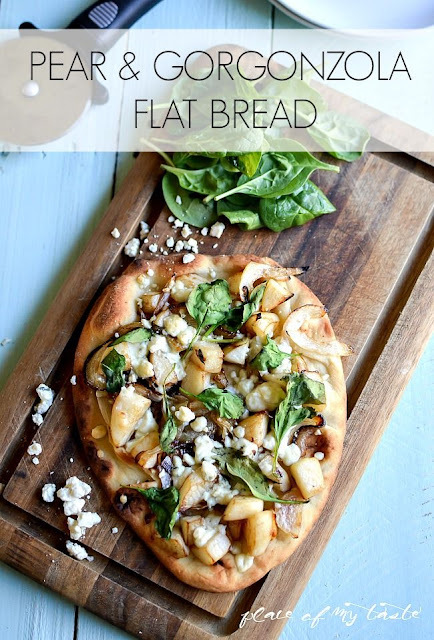 Pear and gorgonzola flatbread sounds delish. i've always wanted to do that with a globe! how fun. love the drink at the top, too! happy weekend! absolutely LOVE that skirt! I am currently wearing one from Loft right now too, my fav store for work clothes!! Hope you have an amazing weekend! That flatbread looks amazing!! And love the globe, I feel like that might be something even my DIY-challenged self could handle, ha! Happy weekend! 1. that pink drink looks amazing 2. I need to make whatever that bread is 3. I have the links! You always find the best links and I thank you for that. I love the DIY Globe! So fab. Hope you have a great weekend. It suppose to be nice!! Although, I could do with less humidity, my hair hates it. I love that globe! How much fun... need to add that to my list. Happy Weekend! That pear and gorgonzola flatbread pizza looks AMAZING!!! Omg, you're making me want to make it right now! Ahh I love that skirt!! It's seriously so pretty!! That globe is too cute too! I hope you have an awesome weekend! That flat bread looks delicious! I'm usually not a big fan of fruit, but I've had the pear/gorgonzola combo before and it's legit. I cannot believe it is almost June either - did we just start this year?! It's crazy how fast time is flying this year! I should be relieved that I don't have to worry about bikini ready abs this summer... but I kind of miss being able to do these work outs, ha ha! But I'll tell you what I'm going to miss more than doing this workouts... being able to bend over, ha ha! Good thing these babes are worth it! I'm saving these videos for post baby workouts! Um....that pear and gorgonzola flat bread looks insane! I think I may just have to try that tonight! Hope you have a great weekend Biana! I swear it was April like last week. Seriously, slow down time. And that flat bread looks legit. So yummy! You always have the best workout picks! And I have the try that flatbread recipe, it looks amazing! Happy Friday and have a great weekend! What great links!! I can't wait to try that flatbread recipe, after I do those bikini workouts of course:) Thanks so much for sharing! I need to try those new TIU workouts! They always do such a great job of putting toegether challenging workouts! can you send that flatbread to my office stat? Many thanks! Delish! That flatbread sounds and looks amazing. And Loft has really been killing it lately, that skirt looks amazing on you! Have a lovely weekend! I need that globe in my life! 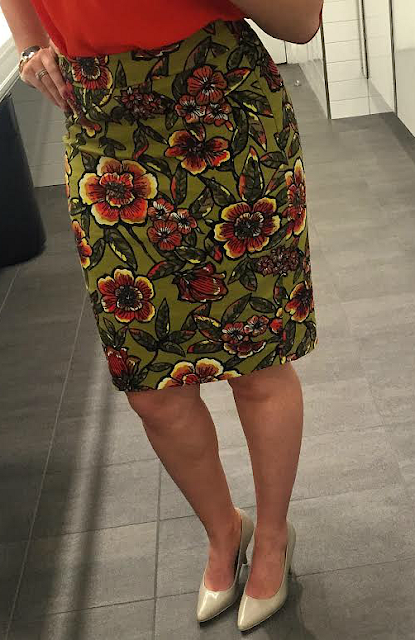 Your skirt is so cute-perfect for work! Have a wonderful weekend, lady! I think I need that globe!!! Love that skirt! And the flat bread looks awesome. I'm so happy it's already Friday. I just love weekends so much. mmmm that flatbread looks GOOD. and how adorable is that skirt?! have a good weekend! Love that work outfit! I'm going to have to check out those workout videos. I've been looking for some new workout options! love the work outfit! so cute! being pregnant makes me miss my regular clothes! its going to be like having a brand new wardrobe in like 6 months when I can wear them all again!! B, I love that skirt so much! Great find and the fact that it is on sale makes it that much better! Pear and gorgonzola flatbread??? Drooling over here. Drooling. Also, that skirt is fabulous on you and what a deal!!!! I puffy heart the Loft. Hope you have a fabulous weekend!!! Oh my goodness I've started doing their workouts too and am just constantly sore! Have a great weekend! I'm definitely going to try that arm workout! I'm always looking for good upper body exercises! That flatbread looks delicious! I've been wanting to test out some recipes and do a flatbread at home soon - we never have before! Great round up this week, lady! That flatbread looks pretty delicious right about now, and I'll have to check out that arm workout video - I wore a sleeveless top yesterday, and I am none to thrilled about how these arms are looking. 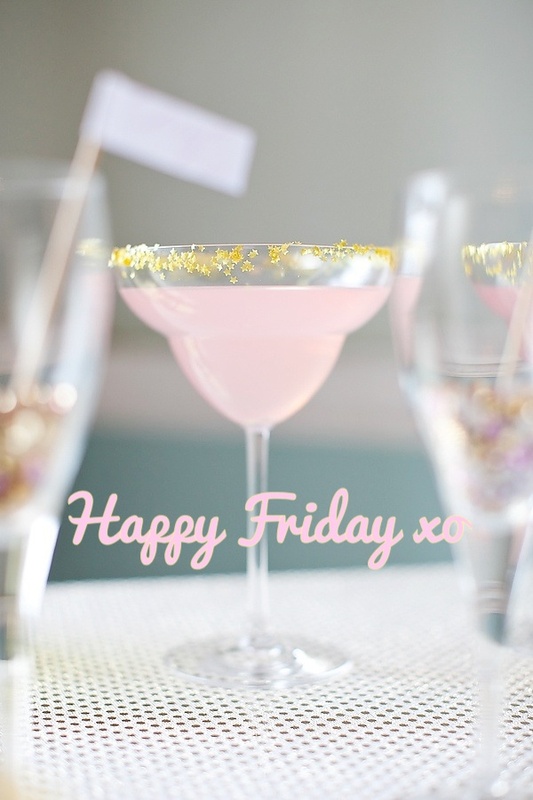 :) I hope you have a fabulous weekend! Love the skirt. I'm a Loft fan myself because they have a lovely petite section :) Happy Friday! I love your roundup mainly because I would eat that entire flatbread and then I would definitely need to do those abs and arms workouts shortly after. HA. That skirt is so adorable too! Love that globe!! And that flat bread looks so amazing! That skirt is amazing. Going to check out what I need to go pick up for my desk ;) Happy Friday! Have a wonderful weekend! I've been slacking off my workout routine. I need to get back on track. Happy Friday! Great favorites! That flatbread looks AMAZING! And I am definitely trying that DIY globe!!! LOVE that pencil skirt! I can't wait to see you style it in different ways. Globes are so adorable, why haven't I purchased one yet? I'd love to do a similar DIY but put little hearts on all the places I've been. (: Have a lovely weekend Biana! I need that globe in my life! It's so pretty. Have a great weekend Biana! I definitely need to give those bikini workout videos a shot this weekend! 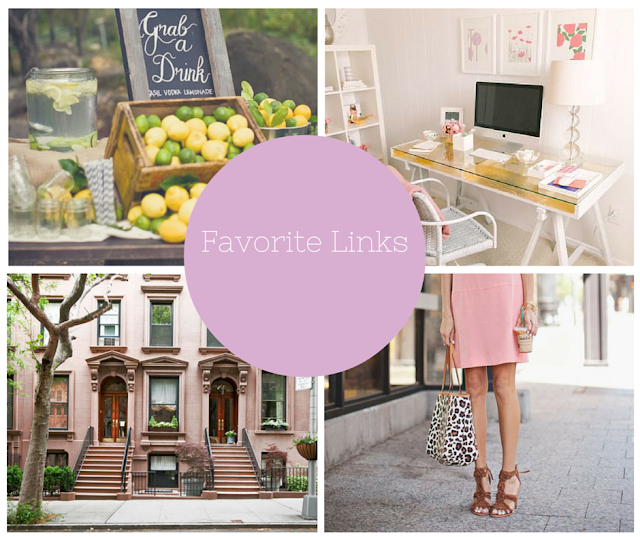 I always enjoy your round ups :) Happy Friday, love! The flatbread looks so delicious! I love that you post that delicious pizza right before a workout!! but both look amazing, I've never heard of the TIU girls, so I will definitely be checking them out! have a great weekend!! I love that world map! And your work skirt is amazing! I love the print! Love that skirt! Great deal! I agree... Slow down time! I can't believe it's June! Yikes!